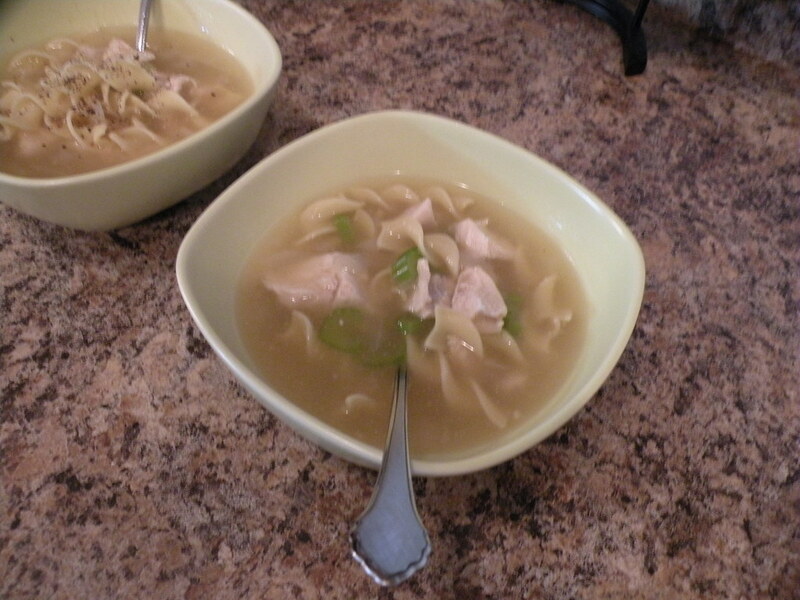 easter dinner preparations were put aside for a little bit today so i could make my snot-filled hubby some chicken noodle soup. sometimes when you’re feeling like crud, nothing tastes better than a bowl of soup, even if it is 72° outside. pre-cook chicken and dice it into small, bite-sized pieces. set aside. bring a med. sauce pan of lightly salted water to a boil, add egg noodles and oil, and boil for 8 min. or until tender. drain and rinse under cool running water. in a large dutch oven, combine broth, salt and poultry seasoning. bring to a boil. stir in celery, onion and garlic. reduce heat, cover and simmer for 15 min. in a small bowl, mix cornstarch and water together until cornstarch is completely dissolved. gradually add to soup, stirring constantly. stir in noodles and chicken, and heat through. enjoy and get well soon, babe!